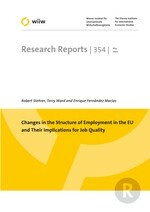 This study considers the overall implications of changes in employment patterns for the nature of the jobs in which people are employed and for job quality, in particular for the EU member states over the period 1995-2005. Jobs, defined as a particular occupation in a particular industry, are ranked according to their relative wage or their relative skill intensity. Given that these job rankings are relatively stable over time, we examine whether job expansion mainly took place for jobs in the lower or upper part of the ranking. Overall, the results suggest an increase in job quality in most of the countries included; in particular, the hypothesis of 'job polarization' could not be supported. The study further includes an analysis of differences with respect to job quality and changes in job quality for a number of other dimensions, such as gender, age, part-time working, fix-term contracts, etc.